Habitat: Cranesbill is native to Europe. The plant prefers full or partial sun and well-drained, loamy soils. Description: Cranesbill is a medium-sized, perennial plant. It grows 25 to 30 cm in height. It has sticky, lobed, fragrant green leaves, which turn red during autumn. Rootstock is long and thick with brown covering and fleshy inner side. Flowers are borne in small clusters, in shades of pink or white. Each flower has five seeds at the bottom of the style. Seeds are small and oval, pale brown in color. Cranesbill flowers in early summer. Medicinal use: Cranesbill was used traditionally as a home remedy in treatment of diarrhea, dysentery, hemorrhages and as a mouth wash for mouth sores and toothaches. Cranesbill is an excellent astringent, styptic and antiseptic. The oil of the Cranesbill, diluted with water can be used as a facial cleanser or added in baths, helping dry and oily skin restore the balance. 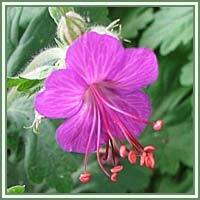 Cranesbill is also helpful in relieving the symptoms of anxiety, PMS and menopausal symptoms. It is considered to be useful in treatment of various skin conditions, such as bruises, cuts, scrapes, eczema and sunburns. 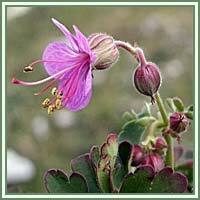 In addition, Cranesbill is beneficial in cases of insomnia and varicose veins. It is also said to be an excellent natural insect repellent.